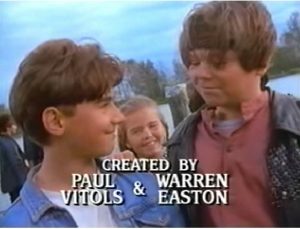 “What’s Wrong with Neil?”, the half-hour comedy written by Warren Easton and me for the CBC anthology series Family Pictures, was aired in Canada on 9 March 1989. Kimmie and I held a broadcast party here, inviting our friends over to watch TV. It was an exciting, thrilling experience–another landmark in the career of the film writer: actually seeing your produced work exhibited for the mass audience. Best of all is if you’re pleased with it yourself, and have a chance to be among that audience while they’re watching it. Everyone I’ve ever seen watching “What’s Wrong with Neil?” has agonized with the hero when his tender love-note is yanked away by the class clown and read mockingly to his peers. People cringe (but in a good way). Then, through the rest of the show, they laugh and are engaged with the story. The elation was much like what I felt at the 1976 B.C. Student Film Festival, when a film I’d made with my friends, “The Device,” a 30-minute silent 8mm Cold War farce, brought much laughter to the audience composed of our competitors and their families (“The Device” won our category of Best High School Film). All that work–and there was plenty–finally pays off: you get to sit back and enjoy the audience’s enjoyment of the show. You can’t beat it. Later on, when The Odyssey was in production, our story editor at the time, Hart Hanson, who was already a very successful TV writer (and is now a writer-producer in Hollywood of shows such as Bones and Joan of Arcadia), said that he had not yet had that experience. Working as a “hired gun” on other people’s shows, he was making lots of money, but never had he written an episode that he felt he could call up his relatives to urge them to tune in and watch. For Warren and me it was the opposite: we weren’t making much money, but we were making shows of our own, that we felt good about inviting people to watch. “What’s Wrong with Neil?” was one of the best of the 16 half-hours produced for Family Pictures. That’s not just my opinion: it was one of only three of the shows that was bought by the BBC for broadcast in Britain, and it also was accepted for competition at the Banff Television Festival that June. Incredibly, “What’s Wrong with Neil?” was selected with four or five other shows from around the world to compete for “Best One-Off Drama Under 60 Minutes”–a category that included shows like a one-hour British drama starring Alan Bates and Maggie Smith. Our little CBC half hour! Michael Chechik, our producer, was very pleased and excited. He too wanted to land a series to produce, and talked up the idea of using “What’s Wrong with Neil?” as a pilot for a series. Audiences loved it and the network was happy with it–why not make more? Warren and I were chilly to this idea. We didn’t see “Neil” as a series. The North Vancouver boy faking “cholera” as a way of dealing with humiliation in front of his peers made for a great half hour, but the family situation and the characters were not otherwise special or interesting enough to power a series. No: we didn’t want to just opportunistically try to stretch our half-hour idea into a whole series, which we felt would not distinguish itself from the pack. We wanted to offer something special, unique–something with lots of “wow” factor. “We need to have an idea that’s a series right from the start,” we said. We already had come up with the boy-in-a-coma idea in December 1987, but because I was worried that the idea was too dark for TV–especially for kids’ TV–we were sitting on that and working on other ideas to run by broadcasters. Thinking it would be cool to do serious, adult, one-hour television, we were tinkering with a couple of ideas. One, tentatively entitled OR Suite, was engendered by the fact that both Warren and I had worked (as janitors) in Vancouver hospitals. It was to be a behind-the-scenes show about the surgeons, nurses, orderlies, and other workers that make up the special team of people in a large hospital’s OR suite. (Just a couple of years later, I was to start watching ER on American network TV–a massive hit.) We liked this idea and spent time creating characters and trying to determine a point of view for the story. Another idea, which we called Paper Tigers, was about a big-city newspaper. We liked the idea of writing about hardbitten, hard-drinking journalists, even though here we didn’t have personal experience of the news business. We fiddled with the idea, trying to jazz it up by adding supernatural elements, even. Michael was willing to pitch just about anything we came up with. I recall putting together the proposal package for Paper Tigers just before I left to do a one-month meditation program in Colorado in April. We were the writers and producers of “What’s Wrong with Neil?”–surely someone would want a TV series from us! We wanted to strike while the iron was still at least fairly warm. However, when I returned from my meditation program in May I learned that no one wanted our Paper Tigers project. We needed something else. Michael said that what the CBC wanted was a show for kids–it had been looking, and not finding. Could Warren and I come up with something in that line? Warren and I no doubt did the equivalent of look at each other significantly. Was prime time ready to watch a whole TV series about a comatose boy? This entry was posted in the odyssey and tagged alan bates, bbc, Bones, canadian broadcasting corporation, ER, family pictures, hart hanson, Joan of Arcadia, maggie smith, michael chechik, or suite, paper tigers, pilot script, ryan reynolds, scriptwriting, the device, the odyssey odyssey, tv series, warren easton, what's wrong with neil?, writing for children, writing for tv. Bookmark the permalink.